Portland Mayor Ethan Strimling delivers his third State of the City address in City Hall in this BDN file photo. Portland Mayor Ethan Strimling said he will propose ambitious changes to city elections, asking for public funding for local campaigns and new lobbyist disclosure rules during a Monday night address. Portland would likely be the first municipality in Maine to install a so-called Clean Election fund and demand its elected officials disclose meetings with lobbyists and other influencers if it does so. 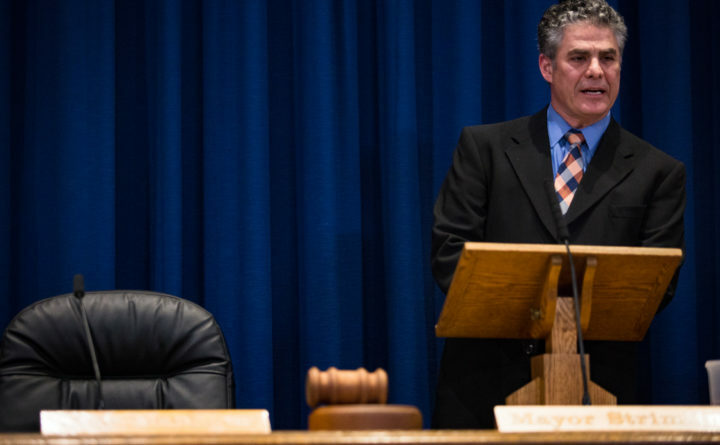 Strimling is entering the final year of his four-year term and is scheduled to deliver his annual State of the City address Monday evening. Since the annual speech was established seven years ago with the restoration of the publicly elected mayor position, it has served as a platform for the mayor to launch new initiatives in a community that’s often a bellwether for the rest of the state. This time, Strimling said he wants to localize elections programs already in place at the state level, in part. “There’s a lot more we need to do to make our government as transparent as it should be,” he told the Bangor Daily News. At the state level, candidates for governor, the House and Senate can use tax dollars to fund their campaigns for office as long as they reach minimum thresholds of individual campaign donations of between $5 and $100. Portland City Council districts are about twice the size of Maine House districts. A House candidate can get about $15,000 in public funding for a contested general election if he or she maximizes qualifying donations, so if a commensurate program is put in place in Portland, each council candidate could cost the city around $30,000. At-large candidates, who represent about as many constituents as one and a half state senators, would cost more. Last fall, there were 10 total council and school board candidates running for office in Portland, although two ran unopposed. If all those candidates sought public campaign funding, the bill for City Hall could grow to be hundreds of thousands of dollars out of an annual budget of nearly $250 million. “I think for the payback in terms of getting big money out of politics, it’s well worth the investment,” said Strimling. Campaign finance disclosures last October showed that while big individual donations were few and far between, there were wide disparities in fundraising among candidates in some races — most notably in an at-large council race between longtime incumbent Nicholas Mavodones, who raised more than $35,000, and challenger Joey Brunelle, who raised less than $6,000. Overall, most candidates for district-level races raise less than $10,000. Strimling himself is among Portland’s most prolific political fundraisers, raising more than $100,000 for his 2015 mayoral campaign, more than twice as much as his closest competitor, then-incumbent Michael Brennan. Strimling was sharply criticized by his opponents at the time for taking more than $30,000 in contributions from real estate developers and their supporters. He was by far the top fundraiser during the 2011 mayoral campaign as well, although Brennan won at the polls that year. “I raise money with the best of them but I understand how money can be part of the system in a way that it shouldn’t be,” he said, adding that a local Clean Elections fund would not be in place by the fall. City Councilor Spencer Thibodeau was the first to announce he’ll run for mayor this year, while at least two other councilors have said they are considering running for the office. Strimling said he will seek to work with the City Council and other stakeholders to develop the details of his proposals over the year. Although there’s more money at stake in launching a public campaign financing program, there’s likely more gray area in his lobbyist disclosure plan. Where would the city draw the line on who is considered a lobbyist? Who would be responsible for reporting interactions and where would that information be kept? Which public officials would be subject to the disclosure rules? In addition to the local Clean Election fund and lobbyist disclosure rules, Strimling said he will reiterate calls to allow noncitizens living in the city legally the right to vote in local elections, as well as urge the city to implement ranked-choice voting in City Council and school board races. Ranked-choice voting is already used in the mayoral elections, as well as in Maine’s congressional races, where the voting method has been disparaged as unfair and unconstitutional by Republican leaders. In Portland, where voters have overwhelmingly supported ranked-choice voting at the polls on multiple occasions, however, the expansion of the method to municipal races will likely be among the least controversial things Strimling pitches Monday. The City Council was expected to approve a referendum last year seeking to give some noncitizens voting rights, but delayed the move after hearing concerns from immigrant advocates that it could backfire and confuse new arrivals who may think they can vote when they can’t. Some form of that proposal would likely return to the council to be placed on the ballot this year with or without Strimling’s shout-out at the State of the City address.